Protesters marched for 12 hours in front of the West County Detention Facility on June 26. Last weekend, thousands of East Bay residents gathered near Lake Merritt in Oakland to protest the immigration policies of the Trump administration. But one group stood out: Nearby, Ruth Sasaki held a sign that read, "My family spent 3.5 years in a 'camp.'" She was there with the Kaiho Collective, a group of artists, scholars, and activists working to highlight the parallels between Trump's immigration policies and Japanese American internment camps. Since the 2016 election, the collective has been going to protests and rallies dressed in the style of incarcerated Japanese Americans in the 1940s: beige button-downs and skirts, white socks, and saddle shoes. "We always talk about the internment of Japanese Americans as a lesson so that it will never happen again," she said. "Well, it's happening." Since Attorney General Jeff Sessions announced a "zero tolerance" policy of criminally charging people who cross the border illegally — which led to the separation of more than 2,300 children from their families — many immigration rights activists throughout the country began to mobilize. Here in the East Bay, organizers say there's a new wave of energy and a stronger platform for their work. About 2,500 people attended the Families Belong Together rally in Oakland last Saturday — part of a nationwide day of action. While many are glad there's a surge in outrage caused by the family separations, they haven't forgotten the bigger picture in their fight — complete immigration reform, an end to detentions and deportations, and the abolishment of the U.S. Immigration and Customs Enforcement agency (ICE) and mass incarceration. In Richmond, people gathered in front of the West County Detention Facility on Tuesday, June 26, for an all-day demonstration. 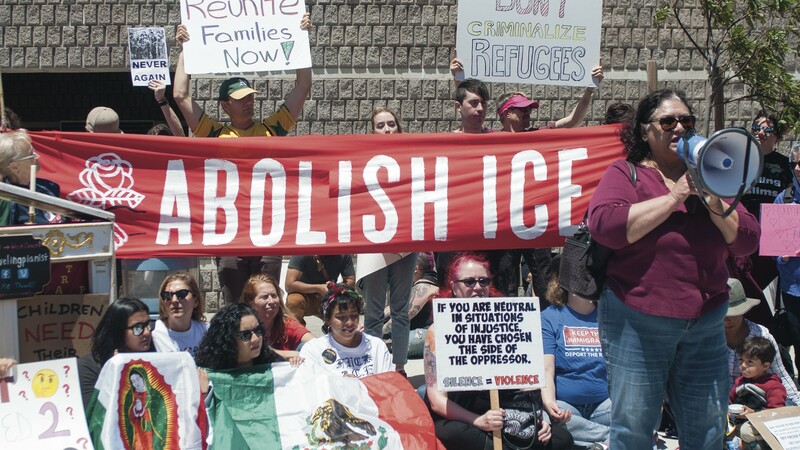 For 12 hours, attendees marched in front of the center around a red sign that read, "Abolish ICE." Olga Talamante, a longtime activist in the East Bay, reminded people that these protests and rallies are part of an ongoing fight. She was an organizer for the United Farm Workers and participated in both the Chicano and anti-Vietnam War movements. She sees these kinds of actions as the only way to not only fight the policies of the Trump administration but to build a stronger community of activists. "The only people that can do this is us with our bodies, and with our voices," she said. Speaking to the crowd in Richmond, she made it clear that even though the rallies of the past week were focused on reuniting families, there is a bigger end goal. "This gives us the opportunity to come together as a people to defend the rights of everyone," she said. "Immigrants, Native people, Black people, queer people. We all need to stand together." Her thoughts were echoed by several other speakers. Tamisha Walker is the founder of the Safe Return Project in Richmond, which helps formerly incarcerated people reconnect with their communities. She founded the organization after spending six months at the West County jail nine years ago. Since then, she said, she never misses an opportunity to connect immigration issues with mass incarceration in the country. "This is where a lot of our families are, not just our immigrant families," she said, noting that her mother and cousin are currently being held at the jail while they await trial. Walker said this connection is often lost when talking about immigration, especially during protests in front of the Richmond jail. Though she was heartened to see so many at the protest, she's wary of their intentions. Often, she said, people come with one specific agenda, or to be an activist for a day without understanding that the residents of Richmond and West County have long been organizing. "When they come here, they need to know that there are people who have been in this detention center and been suffering in this community for a long time," she said. Though the larger conversation around immigration hasn't included discussions of mass incarceration, smaller circles have been making this connection for a long time. Hillary Brooks is an organizer for Let Our People Go, a group that hosts monthly protests in front of the West County jail. She said the protests are intersectional and try to connect the detention of those crossing the border with the mass incarceration of communities of color in the U.S.
She said the current fight does feel different than before: People are more active and there's a general feeling of panic. But like other longtime activists, Brooks hopes people will continue to pay attention long after the family separation practices are over. "I hope everybody is ready to stay in this because it really feels like we are in danger," she said. Many organizers said their main strategy is to create a strong community of activists and residents. Yadira Sanchez, regional organizer for the California Immigrant Youth Justice Alliance (CIYJA), said one of the most important things people can do is to show up and express support for immigrant and marginalized communities. "This country continues to operate under fear tactics, and they want to make sure that we feel isolated," she said. "But we're still united. We're still standing up for our rights." CIYJA's mission is to end deportations and decriminalize all immigrants. Like other activists, Sanchez hopes the uproar around family separations will incite change for all immigrants. "For the longest time, our parents have been the most criminalized in this country and the advocacy continues to be focused on children and youth," Sanchez said. Part of CIYJA's strategy is also to remind people that detentions did not begin with the Trump administration. Like the Kaiho Collective, CIYJA wants to shift the narrative to show people that encampments and incarcerations have long been a part of U.S. history.